Who lived his life on the hermit plan. Since then, they've called him "SUNNY JIM." The figures above were made by Waldo Lanchester to advertise FORCE Breakfast Cereal, at the South London Home Fair, Crystal Palace, in 1934. This was during the time that Waldo Lanchester and Harry Whanslaw were working together as "The London Marionette Theatre." 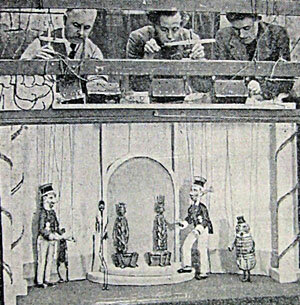 Jim Dumps and Sunny Jim appeared with "King Wheat & his Court" (a group of animated cereals) in their own Marionette Theatre, as seen below in a cutting from The Times from 8th March 1934. 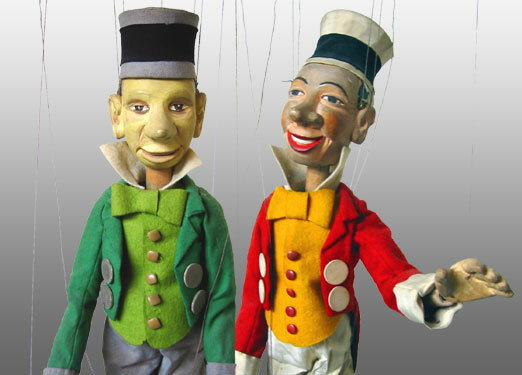 The Lanchester/Whanslaw Partnership worked on several advertising shows during their time as the London Marionette Theatre and Whanslaw recounts a particular accolade paid to them at the end of one of these performances by a young boy, who, upon leaving the show, was overheard to say to his Mother, "I think it was worth at least threepence!"